Several years ago, Carolyn Estes faced a dilemma. A worker with the Oologah Lake Leader newspaper in northeastern Oklahoma, Estes wanted to keep a fishing derby alive for local youngsters, an event that her friend Jackie Donegan had created before health issues sidelined her. “I asked her if I could take it over and run with it,” said Estes. Given the green light to do so, Estes now needed to decide what to call the event – was it a fishing tournament like those seen on Outdoor Channel or was it a derby? So Estes asked Major League Fishing pro Edwin Evers and his Bassmaster Elite Series brother-in-law Terry Butcher what the difference was between a derby and a tournament. “Depends on where you live and how you talk,” the pair quipped. 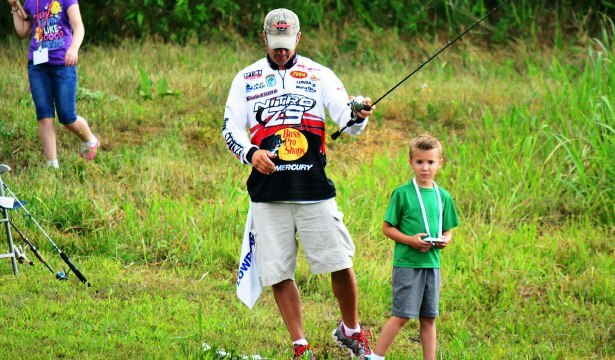 In other words, there really isn’t any difference, especially since the goal is to get kids involved in fishing and spawn a lifelong love of the sport in their young lives. Evers and Butcher - who both live in nearby Talala, Okla. – were intrigued by the idea and agreed to partner with Estes. So did the U.S. Army Corps of Engineers, which offered several ponds as possible sites for the derby to be held on. The first year, Estes and her co-workers weren’t sure what to expect. 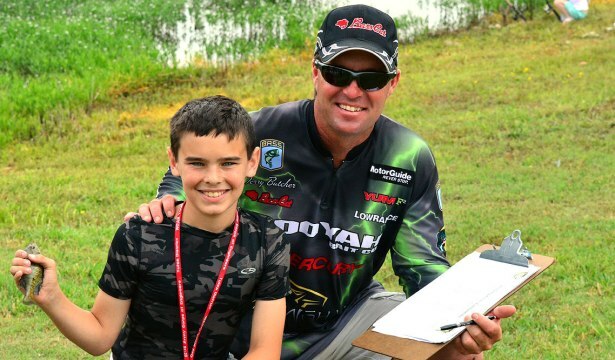 When 150 kids showed up to fish, they all knew that they were on to something big. Perryman said that “everything out here has been donated through one organization or another.” And that’s not to mention the time and effort given by the dozens of volunteers who staff the event, bait hooks with worms, measure fish for prizes, and keep kids having fun. One of those volunteers is Butcher, a former Bassmaster Elite Series touring pro with two B.A.S.S. wins on his resume. “We’re having a (barrel) of fun today,” said Butcher at this year’s derby. “We’re catching perch, bass, crappie, walleye and catfish. And turtles – I’ve weighed everything here today. “We give away a ton of prizes, plenty of trophies, and even life jackets for everyone that’s here,” he added. 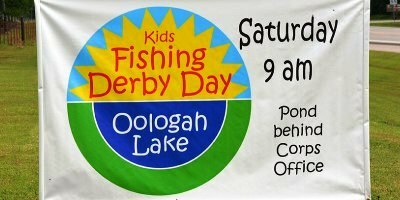 If it sounds like the Oologah Lake Kids Fishing Derby Day has grown to become a “can’t miss” annual event for the region, it has. With crowds as high as 250 kids some years – along with their parents, grandparents, and/or guardians – the event is now one of the best in the Sooner State, if not the nation. “Our goal is to get kids out, teach them how to fish, and to educate them (about the outdoors),” said Estes, noting that the Oklahoma Department of Wildlife Conservation is an educational partner in the event and an integral part of its success. In fact, it’s such key partnerships that make the event what it is each year. Estes notes that the Oologah derby happens each year because numerous caring adults, local and regional businesses, state government agencies and interested organizations join together to ensure that the event is a big success. In doing so, such partners provide the necessary funds and energy that allows for the purchase of properly-fitting life jackets to be given to each kid along with tackle, bait, lures, prizes, food and water. While most such partnerships are local and regional, not all are. In fact, such recognizable names as Bass Pro Shops, Lowrance, Gene Larew Tackle, Booyah, Yum and others were all on the sponsorship list for the 2014 event. One of those heavy hitters is Major League Fishing champion Edwin Evers who annually gives his time and energy to help put on this event held virtually in his own backyard. Evers joked that it could be even more fun if the event would eventually adopt Major League Fishing’s SCORETRACKER LIVE tournament scoring system. Except for this fact: It might actually lure in even more kids to an annual event that has already outgrown its already generous-size facilities. Estes' goal is to make sure such big crowds continue to show up each year in what she calls the “most important event I do all year long. Such a sad outcome – losing the current generation when it comes to outdoors recreation – is something that Estes isn’t willing to accept. All of that birthed a lifelong passion for the outdoors world in Estes, one that she is eager to pass on in any way possible. Aside from passing along her love of the outdoors to her own immediate family, Estes also is consumed with the idea of doing so at a larger level by way of the annual Oologah Lake Kid’s Fishing Derby Day. “Being outside, learning the skills, and having the time to enjoy what we have without being inside all of the time is just extremely important to me,” she said. “It’s really important to me,” said the 2013 MLF Challenge Cup Champion from Florida’s Lake Istokpoga. That’s why Evers, Butcher and several other local pros invest their time and energy in the derby each year.v“We just try (to do what we can do to help them),” said Evers, an eight-time winner on the B.A.S.S. tournament trail. From the big smiles evident on the faces of a couple of hundred kids and their parents, that would indeed seem to be the case. One of those smiles belonged to five-year-old Hunter Jenkins, an Oologah Lake area kindergarten student. That’s a pretty good effort by any angler, even tournament pros like Butcher and Evers. In fact, when asked if he thought his angling skills at the derby were up to the challenge of beating the pros that were helping out, Jenkins smiled big and nodded his head in the affirmative. And that might be one of the Oologah Lake Kids Fishing Derby’s biggest wins, the spawning of yet another lifelong love affair with the sport of fishing. One that one day might even take a youngster from casting a worm into a small northeastern Oklahoma pond to the sport’s highest levels of completion on a stage where he or she is hoisting up a Major League Fishing trophy after beating the likes of Evers, or even KVD.